Here’s how to get MacBook Pro’s Touch Bar feature on your iOS 10 powered iPhone device. Here are the details. It was only a matter of time until someone was inspired enough by Apple’s new MacBook Pros with Touch Bar to go ahead and try and port a similar experience to jailbroken iOS devices. There’s been intense speculation about Apple’s next-generation iPhone 8, and more specifically that it could come with a virtual tray at the bottom of the new edge-to-edge device which could have a Touch Bar-esque experience. 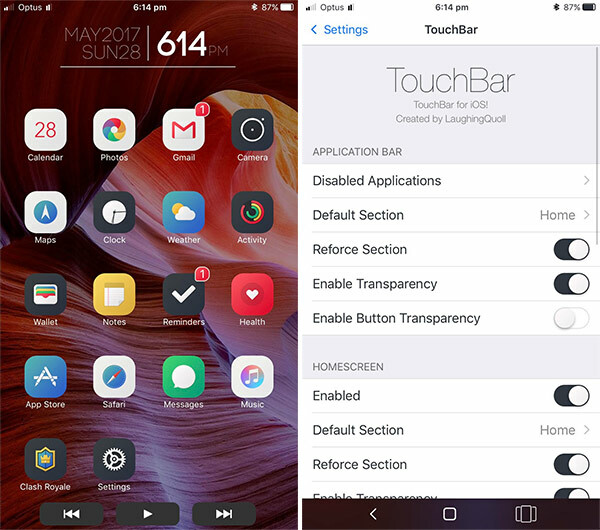 Whether it will happen or not we are still not sure, but for those with jailbroken hardware, there is now the ‘TouchBar’ tweak to take advantage of. This one is actually a very beautiful implementation, and it is also very simple in what it sets out to do. The Touch Bar experience from Apple’s newest MacBook Pros has been somewhat adapted for iOS with this package by placing a clear and easy-to-use function bar at the bottom of the display. Just like on the MacBook Pro, that function bar offers very specific functionality with a single touch, and it also introduces the ability to change exactly what can be achieved. There’s also a fairly decent configuration panel with the package to tweak it to the user’s exact requirements. When first installed, users are presented with a single function area containing buttons to go back in the navigation stack to mimic the Home button on the device, and to instantly enter the app switcher to see what apps are sitting in the background. 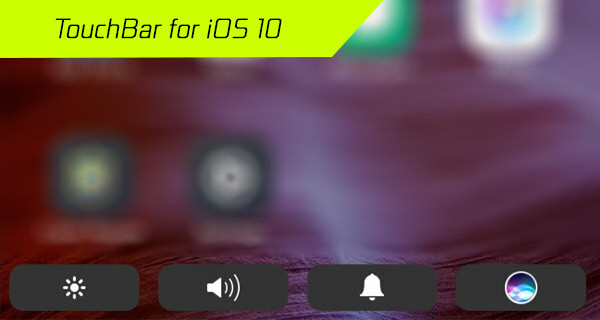 A left swipe on that function area moves into the next control area which offers a series of controls to toggle things like brightness, volume, alarms, and access to Siri. An additional swipe then takes the user into the area that allows music to be controlled. It’s likely that this will be one of the most utilized areas. Unlike Apple’s implementation on MacBook Pro, the TouchBar tweak for iOS doesn’t dynamically change what’s being offered based on the type of app that is running. As an example, when a user is playing music through the native Music app, TouchBar doesn’t automatically present the music controls to the user. This may come in the future if the tweak proves to be popular, but for now, this is a gorgeous and very professional reimagining of the MacBook Pro Touch Bar experience for iOS albeit a bit limited in functionality. TouchBar jailbreak tweak can be grabbed for $2 from the BigBoss repository in Cydia. That nav bar looks so familiar. Where have I seen that before? How to get a “touch bar” on a “touch screen”….. wow, what a genius!